If you read my blog regularly, you will probably remember my post on the reveal of my son's big boy room last September. 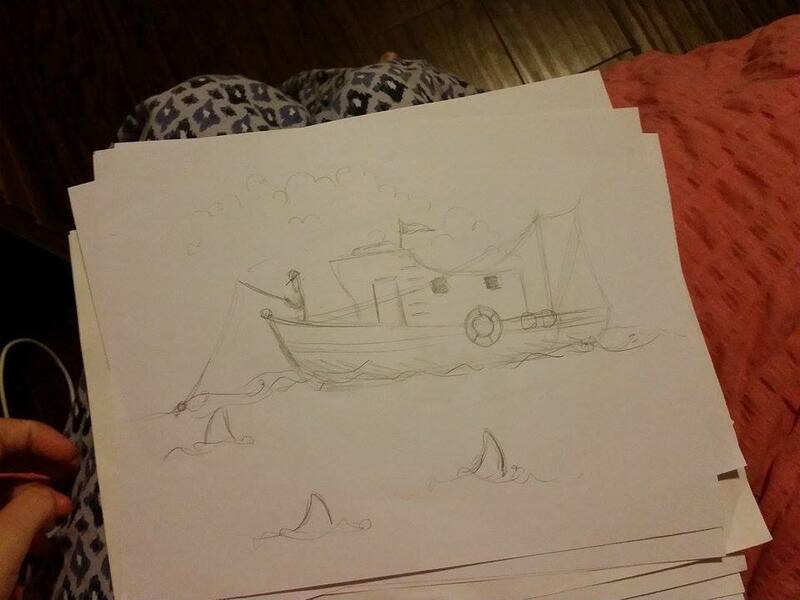 He is so into water, sharks, and boats so I ended up decorating it in a nautical theme which he loves so much. 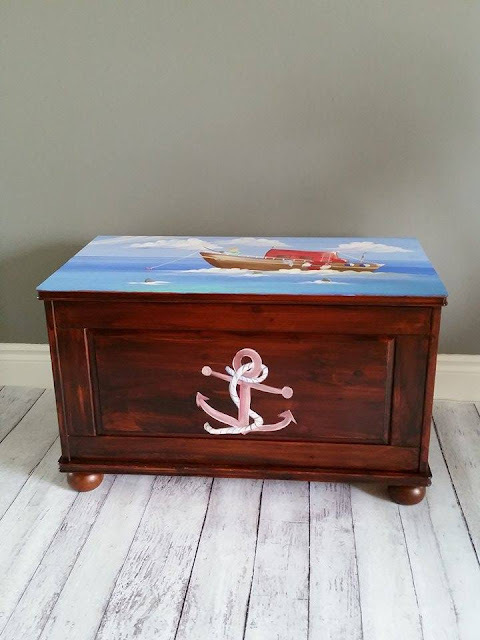 For some extra storage in his room I wanted to bring a toy box into the space. Not for toys necessary, but more to store extra books or blankets or stuffed animals. 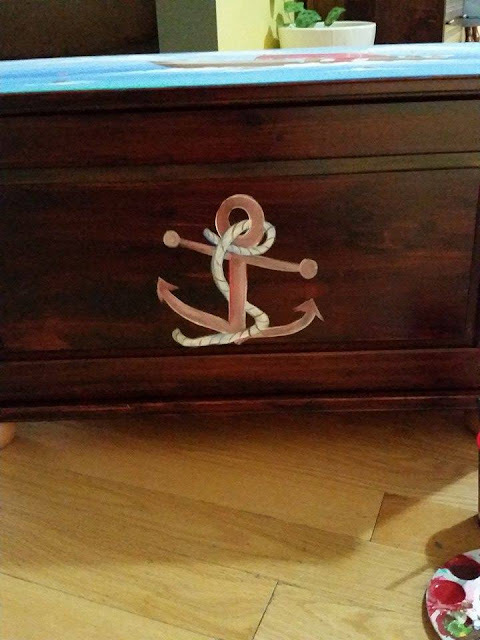 I searched and searched online and found nothing that I really liked or that was in my price range, until I came across Whimsical Imaginings on Facebook. 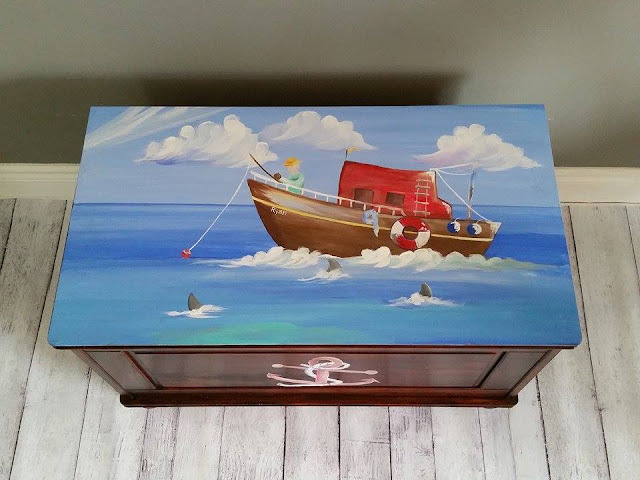 Serina from Whimsical Imaginings does custom oil paintings for babies and children's rooms. She is so amazing and very talented. Now I know what you're probably thinking...custom = expensive right? Well, that sometimes is true, but not at Whimsical Imaginings. She is very affordable. 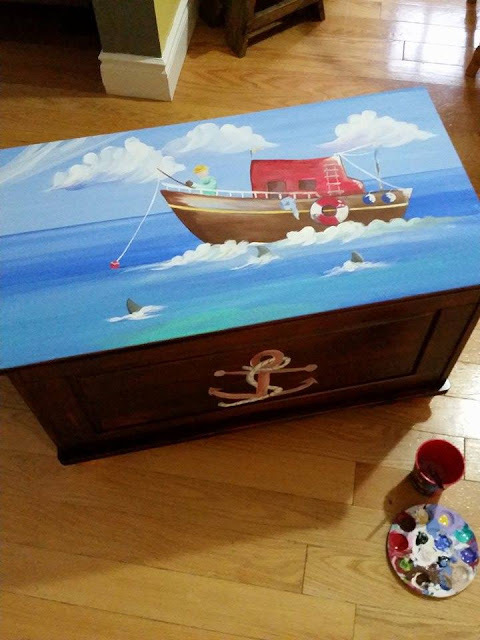 She didn't supply the toy box, but she will refinish it for you and do the custom artwork on it. I bought mine on Kijiji. 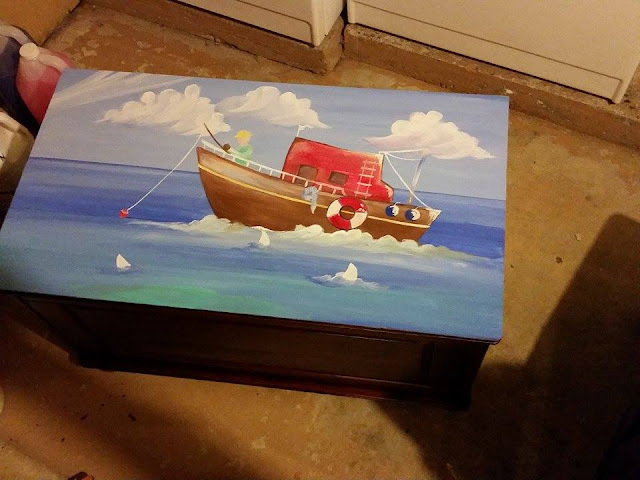 The toy box is solid pine which cost me $30, and she charged $50 for the artwork. Reasonable right? I think so. What I loved about choosing Whimsical Imaginings is all the steps that she takes to keep the "client" in the loop. She takes her time and sends updates on her progress. It wasn't just one email from me saying what I wanted, and she says "ok," and then you hope for the best. With her procedure, you stay in the loop. This way, it turns out like how you envisioned it because you were part of the process. Once I dropped the toy box off to her, she told me to email her what I wanted in the painting, and any inspiration pictures that I had. So, I did just that. 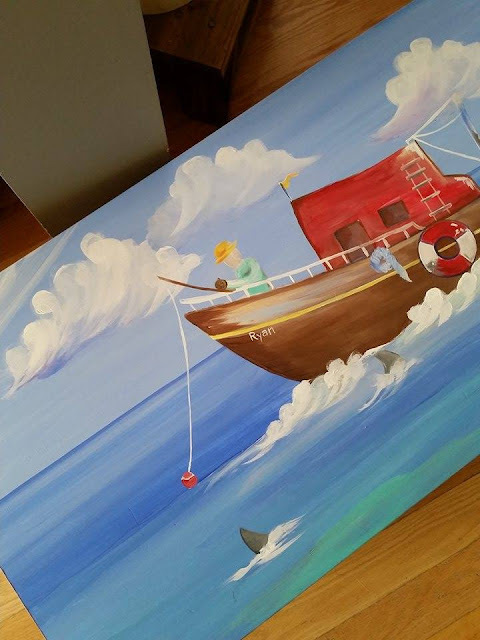 I told her I wanted a nautical painting that included a boat, sharks, and a fisherman. All things my son loves. I also sent her a couple of pictures too. 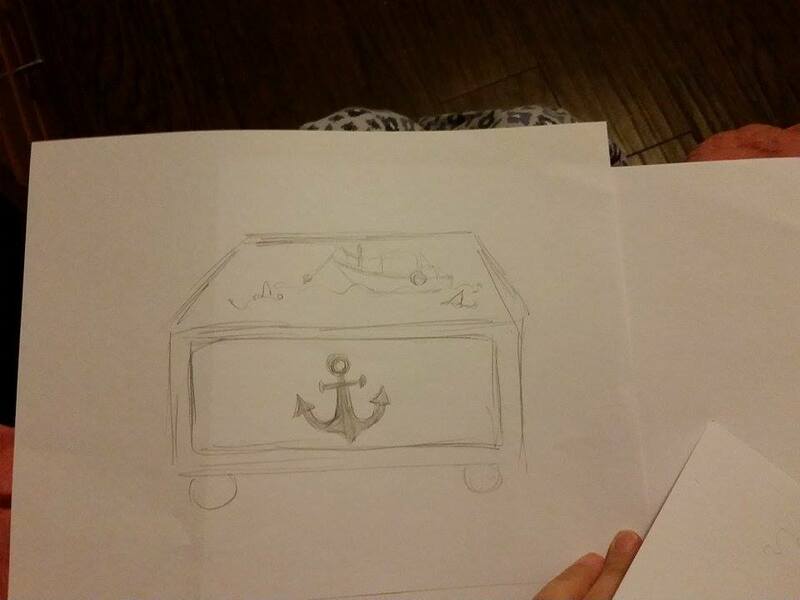 Then, a few days later she starts a sketch, and she sent it to me to approve. 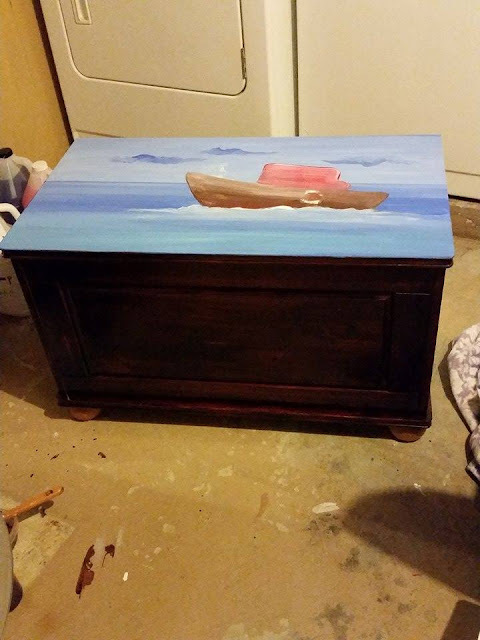 Once the sketch is approved, you then have the choice to have her refinish the box or paint it. 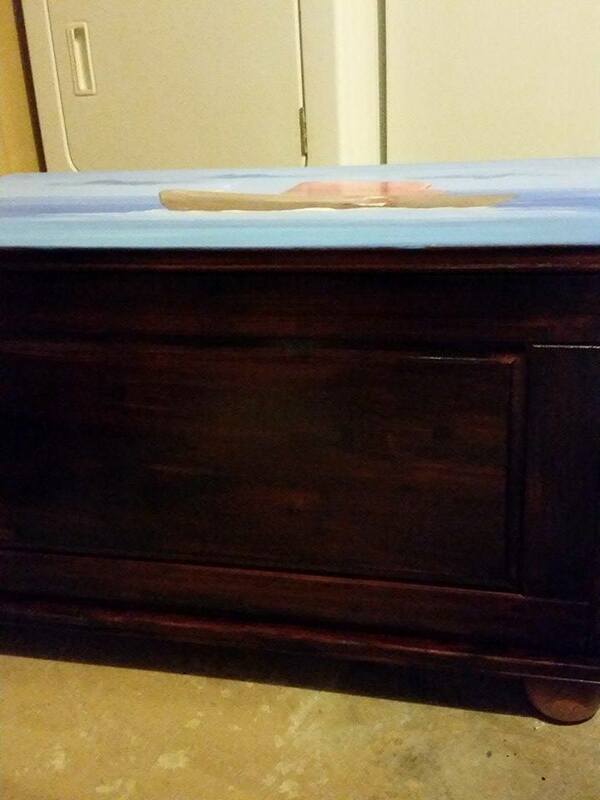 I had some extra stain from my son's bedroom furniture, so I got her to stain it the same colour so it all matched. 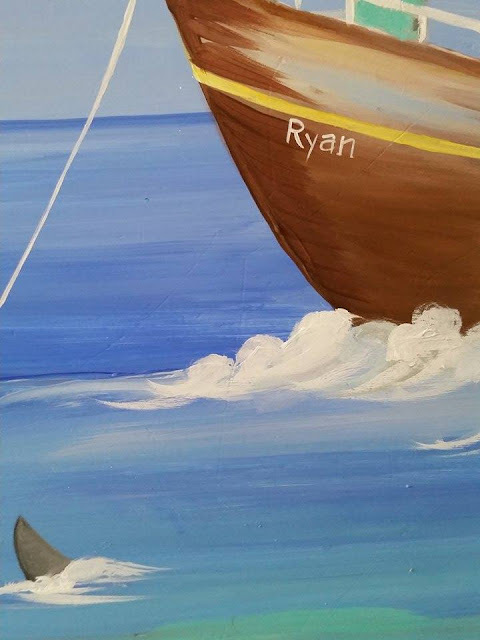 I also gave her some extra paint that we used on the walls in his room to incorporate into the painting. Once it was stained, she sent me a picture to approve and then she started on the painting. I loved checking my email and receiving progress photos. It was great seeing the stages of the painting coming together. It's amazing to see all the details and layering of colours that goes into the design. Once the artwork was complete I had the option of personalizing it. Since I am keeping this toy box for him as a keepsake, I decided to put his name on the boat. I hope one day he has a little boy so he can pass down this toy box to him. It would be so special and hold so many amazing memories. Here is the toy box in his room. I think it looks great and fits perfectly. Whimsical Imaginings doesn't only do custom paintings on toy boxes, she also does custom wall art, and name signs too. Check her out her Facebook Page HERE or her website HERE. Serina has amazing talent and was a pleasure to work with. 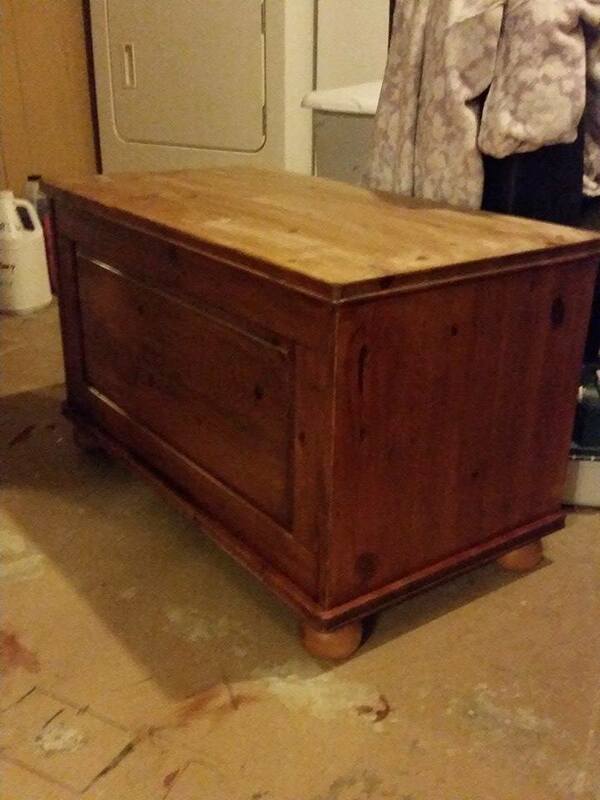 I can't wait to use her again to paint a toy box for my daughters room too.